No sooner has the new year begun – and before the start of the NAMM Show in Anaheim/USA at the end of this month – CASIO causes a surprise with not one, but two new digital pianos: the CDP-S100 and CDP-S350 models from the brand new CDP-S series will in future be enhancing the range of portable digital pianos. 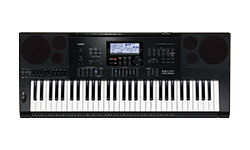 Furthermore, CASIO is expanding its range of digital piano accessories – suitable for the new models. . 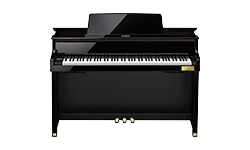 The CDP-S100 (RRP €449) is the entry-level model of the new CDP-S series and convinces with outstanding functions such as a new hammer action, a new sound generation, a new loudspeaker system and the option to connect to the "Chordana Play for Piano" app by CASIO. At 10.5 kilograms the CDP-S100 is a real lightweight and, thanks to the optional battery mode, can be used anywhere and everywhere. .
Just like the CDP-S100 the CDP-S100 (RRP €599) not only convinces with a new hammer action and a new loudspeaker system – the ensemble model of the new CDP-S series also scores when it comes to sounds and rhythms. The CDP-S350 is an optimum instrument both for beginners and advanced players who greatly value portability and sound diversity. With the optional CS-46 stand (RRP €99) the CDP-S100 and the CDP-S350 quickly transform into practical standing models. The CDP-350 can also be connected with the new 3 pedal unit SP-34 (RRP €69). Furthermore, for on the road CASIO offers the practicalSC-800 piano transport bag (RRP €129) with a rucksack function. The new CDP-S series and the accompanying accessories will be available in specialist retailers from February 2019. Norderstedt, 6 June 2018 – Following Cory Henry's CASIO visit during Musikmesse to present the new CT-X keyboard series, part two of the successful cooperation now follows: CASIO is releasing a new music video today with Cory Henry at the keys of the new CT-X5000 keyboard. The video was shot in Frankfurt am Main in a 16-metre-long "light cocoon" in the shape of a zeppelin, which was placed on the grass verge of Niebelungenallee in Frankfurt's Nordend district during the "Luminale 2006". Cory Henry prepared the track now being released in advance of the shooting and – according to his statement – had a lot of fun with the new CT-X5000: "I had a wonderful time recording the track for the video – really, I sat at home for hours jamming."